It's time to a cook lamb chops served with creamy Thai peanut sauce. Nothing tastes as good as properly cooked tender lamb meat. If you prefer to use your very own local dip, feel free to replace it with peanut sauce. I've kept the chops' flavor mild which can be moderated as per your taste. These chops are pan-seared which can be changed to grilled version too. If you're using white meat like chicken legs, pay attention to the cooking time to get the best results. You can also use boneless lamb meat instead of using chops. To make the serving a bit spicy, you can add few chili flakes to the peanut sauce. So here we go to make these lip-smacking lamb chops served with equally tasty Thai peanut sauce. 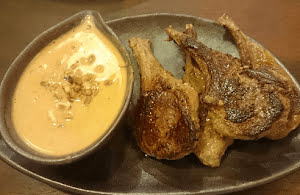 Savor this hot and scrumptious lamb chops recipe which is flavored with mild seasoning ingredients and is served with creamy and rich peanut dipping sauce. Add all the peanut sauce ingredients in a blender and pulse for about a minute. Transfer the sauce in a serving bowl and garnish with roasted peanuts. Keep aside. Combine black pepper powder, dried rosemary powder, garlic cloves paste, extra virgin olive oil, and sea salt in a bowl. Add lamb chops in it and rub the seasoning on all the chops with you hands. Cover the bowl with an aluminum foil and refrigerate for about 45 minutes. Take out the bowl from the refrigerator and let the chops come down to the room temperature. Heat a large nonstick pan on a medium flame. Sear all the seasoned lamb chops from both the sides for 4 minutes each. Serve hot with peanut dipping sauce.